If we learn more from losses than wins, then the Canberra system has much to gain from examining its lousy performance in the processes that took Australia to war in Vietnam and Iraq. 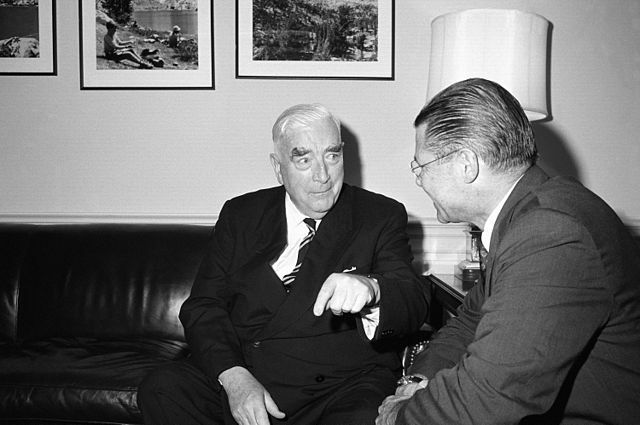 For Australia, both wars were all about the alliance with the United States. Both were wars of choice, although the regional implications Canberra read into Vietnam meant it was closer to a war of necessity than Iraq. Both wars exemplify the Prime Minister’s most profound prerogative  and Parliament’s lack of power. The entry to both showed the Canberra system performing below its best, revealing again the truth that artifice and farce often attend the most serious of moments of government. In announcing the deployment to Vietnam, the farce was the last minute rush to extract a formal request from the government of South Vietnam, to veil the patent reality that this was a response to US needs. In the case of Iraq, the artifice was the Howard Government’s claim through 2002 and early 2003 that it was still to make up its mind about whether or not to go to war—a thin veil over the patent reality that this was all about the alliance and that Australia was deeply committed to US invasion plans. A quickly mocked-up invitation to Vietnam and a false will-we-won’t-we facade on the approach to Iraq… Q: Why are voters so cynical and dismissive about the noble and historic efforts of their leaders to shape and direct history? A: History. To examine the parallels between Vietnam and Iraq, turn to Garry Woodard—a former Australian ambassador in Asia and long-time deep thinker about Oz diplomacy—who has mused several times on the subject , most notably in his book ‘Asian Alternatives: Australia’s Vietnam Decision and Lessons on Going to War ’. The focus of the book is Vietnam. Woodard was an Australian diplomat during the Vietnam War and he writes: ‘Former participants to whatever degree in any aspect of the Vietnam War are different. They write about it with a heavy heart and feelings of inadequacy.’ Iraq participants know the emotions. He concludes his book by listing 50 points of similarity between Australia’s march to both Vietnam and Iraq, headed by a quote from Proust: ‘The past not merely is not fugitive, it remains present’. in both cases, Australia put its standing in Asia at risk. The Coalition launched the war without enough troops, US or allied, to do the job and without a strategy, force structure and the necessary civil capabilities for meeting the main challenge. Having blundered into a hornets’ nest, the intervening force and its allies in Iraq have taken a hammering. The fate of our Iraqi allies, and their civil population, like that of our Vietnamese partners in the 1970s, is perhaps the saddest aspect of the war. Australia went into Iraq far more cautiously than it did in Vietnam and got out before the dust of invasion cleared. We were slowly drawn back in by alliance demands in later years, but again the commitment was limited and confined, which is why the price payed in Australian blood was so low. The fact that no Australian soldiers died during the invasion helps explain why the 10th anniversary of the war can pass with another bout of Canberra silence. What we did in Iraq was all about the US and little about Iraq. Canberra even quibbled about the responsibility it bore for Iraq’s future as one of the occupying powers involved in a successful invasion. The Canberra shrug at the talk of responsibility was accompanied by a rapid pass-the-parcel gesture towards Washington. From the start Howard was determined to extract whatever benefits he could from Iraq at the minimum risk, and he seems to have understood those risks more clearly than either Bush or Blair. He pulled Australian troops out of Iraq just weeks after Baghdad fell in April 2003, and when they went back in 2005 Howard made sure they were deployed in a quiet sector, largely out of harm’s way. There is something to admire in this, but it came at a cost. The only gain Howard can claim for joining the invasion was strengthening the US alliance. But – though Bush hailed him as ‘a man of steel’ – the gap between Howard’s bold talk and his ultra-cautious actions undermined Australia’s standing as an ally. And what little we did in Iraq is increasingly irrelevant to an alliance now becoming ever more focused on China. Even in Howard’s terms, it is hard to see that invading Iraq was good for Australia. Australia has a penchant for taking advantage of events to strengthen the alliance. In some respects this is a rebuttal to Graeme Dobell’s argument—in many ways, Iraq wasn’t as important as strengthening the alliance. In this, the Iraq war decision-making succeeded; we aimed to bolster our alliance credentials, and did. While Australia took advantage of the American grand strategies that took them and us into the Vietnam and Iraq Wars, we were in a sense not too concerned about the outcomes and potential downsides that could—and did—leave America worse off. That surely wasn’t our desire. Nor was it overall a good outcome for us, but our limited goals were achieved. Limited goals achieved! Grand strategy can sometimes be a bit counter-intuitive, but do we truly bolster our alliance credentials by cheering on the US as it plunges into quagmire, fiasco and folly? It surely pushes the conceptual envelope to breaking point to think that huge disasters which sap America’s treasure and national psyche are in any sense good for Australian alliance goals. As Peter also argued in last week’s post, a principal concern for Australia must be about the US doing harm to itself and thereby diminishing its ability to shape the world to its (and our) advantage. That’s a Vietnam truth taught again in Iraq. Graeme Dobell is the ASPI journalism fellow. Image courtesy of Wikimedia Commons .